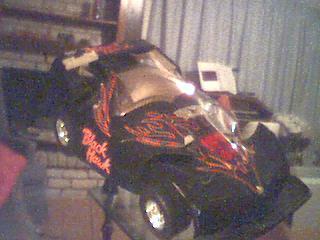 This is the RC car that for a few years people on the internet were able to drive around the house. It worked pretty well, its major shortcoming being the 3 hour limit. After that the batteries (which powered the car, the cam and the cam transmitter) would run out of juice. I planned to solve this problem by upgrading to a new car, which I will display tomorrow. However, when I was moving the equipment over, I somehow fried the transmitter, so it no longer works. A travesty I will redeem once I buy a new one, the car will be great again. Soon. So very soon.